Particularly over the past year or so, we’ve seen plenty of beers that use fruit, chocolate and every other adjunct you can think of, to create bold new experiences in flavour and aroma. As exciting as these brews are though, it’s hard to beat the astonishing variety that can be accomplished using just three simple ingredients: Malt, hops and yeast. To celebrate beer in its truest form, Beer52 has partnered with Brouwerij Anders, one of Belgium’s most respected breweries, on The Elements Project: a series of beers that will allow members to compare and contrast the myriad different characters that can be created by tweaking just one element of some classic beer recipes. 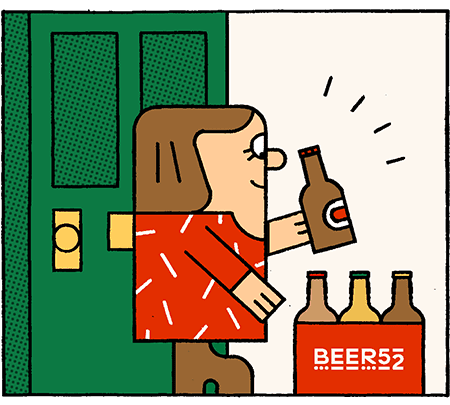 Throw in original label artwork from some of our favourite designers and you have a truly unique and ambitious collaboration, exclusively for Beer52 members; the first of its kind for any craft beer club. I was introduced to Anders Brewery by a good friend of mine, Ronald De Waal (aka The Flying Dutchman). A true nomad brewer with over 20 years’ experience, he’s one of the torchbearers of the gypsy brewing movement in Europe. Nowadays, Ronald brews his awesome range of beers at Anders, as do our friends at the Brussels Beer Project. After an initial chat about our vision for The Elements Project with Pieter De Bock, Brewmaster at Anders, he immediately understood and rather excitedly started bouncing his own ideas around at what was possible with different ingredients and processes. I knew then that we could create something special together; it was on. I spent the next week in sourcing of some of my all-time favourite beers, covering a wide variety of styles from the classic Belgian Blonde to the supermodern, hazy New England style IPAs. So, armed with a couple of heavy suitcases loaded with beers that we could taste and reference together, I headed off to design the beers with Peiter at Anders Brewery, based in Halen, a sleepy little Belgian town 60km east of Brussels. Over the course of a few days together, we separated out the beers into our three categories – hops, malt and yeast – and tasted dozens of worldclass examples that championed each particular ingredient. Think a table load of Belgian beers for our yeast, big-hitting modern IPAs for the hops and full bodied roasted stouts and sweet ambers for the malts. With the beers all lined up on a table with corresponding tasting notes, we enjoyed deliberating and deciphering the exact characteristics, asking what would really shine through if we could only change one thing in the beer. To help in our decisions, we practically emptied the store cupboard all variations of malt and hops strewn across the brewery tasting room.